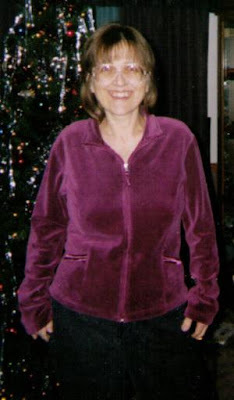 Near the end of last week, a dear friend died. 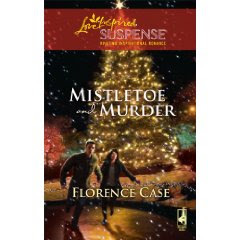 Flo's next book, MISTLETOE AND MURDER, will be released November 2009 as part of Steeple Hill's Love Inspired Suspense line. About five years ago, a wonderful writer named Misty Simon started an online loop. Several writers joined. We had different goals, but they were all writing related. People came and went from the loop. Some hung in longer than others. Some posted lots; some posted less. Eventually, there were only seven of us left. Seven writers who stayed. And got closer. And more supportive. And more of us got published. Over time, we've even developed a odd list of expressions specific just to our group. Our own little loop language. Flo was an integral part of our little clan. She offered words of wisdom, her wit, her very unique perspective on life. She worked hard at writing. She personified persistence. Flo landed her dream agent. She landed her dream editor. Her writing career solidified. Then, unfortunately, cancer knocked at her door. More like pounded it down. Some of us have met in real life. I've met two of the members. Not Flo. None of us has met everyone in the group. Today we decided to rectify that. We're planning a get-together for the summer of 2010. In Portland. We'll spend time remembering Flo. And getting acquainted offline. And writing. Thank you, Flo, for all that you gave. Your input helped me become the writer I am today. I'll never forget you. Here's the cover of Flo's November 2009 release. Seaport Village is a unique shopping area on San Diego Bay. You park your car in the Seaport Village lot (hint: make sure you get your ticket validated for two hours of free parking, even if it means buying a cup of coffee), then wander along four-ish miles of paths that lead to various free-standing buildings which make up fifty plus shops. There are several restaurants as well. No two stores are alike. For example, there's a kite store, a shell store, a wooden toys stores, a wind chimes store. Oh, and there's a hot sauce store, which figures in I So Don't Do Makeup! Could a trip to Seaport Village end up being an over-priced bayside shopping experience? Uh, yes. If you let it be. BUT, you are meandering right next to the water. And there's something exhilarating about that ocean view and air. AND there's a great grassy area for kite flying. This is the sign outside one of my favorite establishments at Seaport Village. Here's a shot from inside. 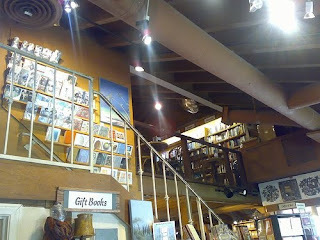 It really is a terrific bookstore + coffee shop. There are even free board games (like checkers) and tables where you can play. 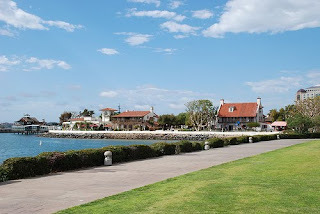 I always include some time at Seaport Village for my out-of-town visitors. 1. Chiefly British. to entertain by dancing, singing, or reciting on the street or in a public place. 2. Canadian. to make a showy or noisy appeal. Say what? "To busk" has a different definition in Canada? I must check with my sisters! 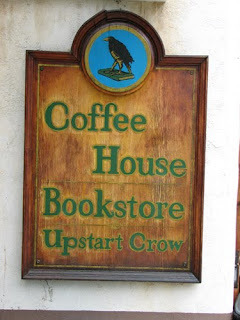 I was also going to include more trivia about the "upstart crow." However, I've run out of time. I'll get to it, though. One of these days. For links to the other MTM participants, please head over to our My Town Monday blog which was set up by Clair Dickson. Also, if you're even mariginally thinking writing a My-Town-Monday post, please do! Join in! We'd love to have you! I didn't take this photo. It's from google images. But you'll get the idea from it. Last night at midnight, my cell phone rang. Child #1 was still out and about. The blood coursing through my veins immediately turned to ice water. Every parent of a driving teen reading this blog can relate. Every parent of a child who will one day be a driving teen can probably too. Child #1: "Mom, Mom, I hit the median." Child #1: "No, but my tire popped." Child #1: "There's no one else around. But I can't drive home. The rim's wrecked." Me: "Get out your AAA card and call for a tow truck. I'll wait up." I think back to my days as a speech pathologist at a San Diego hospital. Back to when I had two guys in their early twenties on my case load. One had wrapped his vehicle around a tree. The other looked away from the road to adjust his car stero and careened into a transport truck. Both guys were brain damaged. Neither would ever go back to the way he'd been pre car accident. 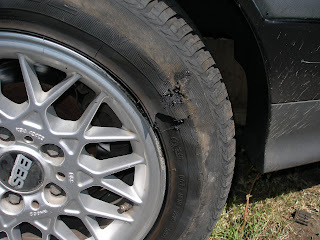 A popped tire and a bent-out-of-usefulness rim? For today's My Town Monday post, we're visiting my house. Our veiled chameleons' cage, to be exact. Because before I went to Oklahoma, something uberly exciting happened here. OUR FEMALE VEILED CHAMELEON LAID 42 EGGS!! I know, it's craaazzzy. She laid 23 eggs at the end of May. There are only 5 healthy eggs left from this first batch. The 42 eggs from this second batch look plumper and healthier. She's laying eggs about every 3 months. Holy Color-Changing Reptile! She was a little cranky with the male for a couple of days before THE EVENT. See the blue robin-eggish spots which indicate pregnancy. Here is her very fat tummy. Not including her tail, she's about 5 inches long. We still can't believe she had 42 eggs tucked in there. Child #2 and Child #4 fill a five-gallon flower pot with sand from our sandbox. They stir in water for a damp mixture. After digging down about 8 inches, Child #2 finds the first layer of eggs. Here he is setting them carefully in vermiculite in a deli dish. Our incubator is full! With FORTY-SEVEN eggs (5 from the first batch + 42 from this second batch). Child #2 has started planning how he'll spend his riches. Each baby fetches $25 from our local reptile pet store. Here's the proud papa. Not really. He slept through her whole ordeal. 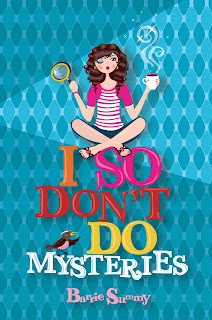 For links to the other MTM participants, please head over to our My Town Monday blog which was set up by Clair Dickson. Thank you Clair! I'll be back to a regular kind of post next Monday, but I couldn't resist sharing the good news. The biggest hugest thank-you to Bookworm who made this book trailer. Just made it as a surprise for me and then posted it on YouTube and on her blog. How incredibly wonderful it that?! I'm in Oklahoma doing school presentations and participating in an author panel for EncycloMedia (a conference for educators). 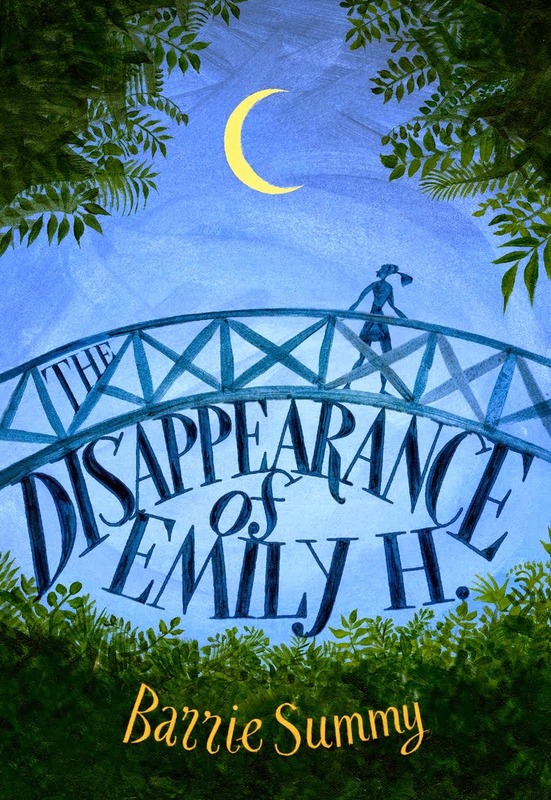 I'm showing this beautiful, fun, snappy, excellent book trailer to everyone who will watch it! 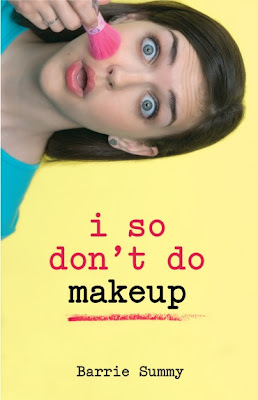 I SO DON'T DO MAKEUP!! in stores December 8, 2009. Sherry Holmes Baldwin is baaack!! Sherry and her ghost mother team up in a new mystery involving The Ruler (Sherry's stepmom) and a stalker. It's scary. It's spooky. It's fun. Oooooo. All these books are available for pre-order. 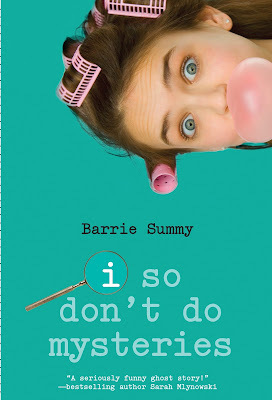 And so as not to leave out any of the covers: Book #1, hardback version, is currently available all over the place. It's been a long, long hot summer. By last Friday, my kids had been off for ONE HUNDRED NINE DAYS. That's A LOT of togetherness! And, while my children are decidedly adorable, a mother needs to know when to stamp her little flip-flopped foot and say, "Enough is enough." So...I called four very good friends and arranged for an Evening of Escape to La Jolla, a super affluent, San Diego community. An Evening of Escape involves adult conversation, fancy food, umbrella drinks, a sea breeze, beautiful views and a stroll along boutique-lined streets. I wish you all could've joined us. La Jolla is so affluent even the trash cans are pretty. Here we are, posed in front of our new friend, the Half-Naked Mermaid Statue. We chose a restaurant with an ocean view. To the right, we could see La Jolla Shores. To the left, we could see La Jolla Cove. At this particular restaurant, half-priced appetizers and happy-hour drinks were available on the patio, but were full price in the main restaurant. We, uh, chose a table on the patio. BTW, this is not an unusual arrangement in La Jolla restaurants. So, if it's Happy Hour when you're picking a watering hole, keep in mind that prices can vary depending on where you sit. Anyway, we ordered 9 of the 19 appetizers (that's 47.4% for you detail-oriented readers) on the Patio Menu, which turned out to be more than enough dinner for the six of us. My favorite was the Ahi Tuna Poke. I do have a love affair going with raw tuna. Second was the Slow Braised Short Ribs. Third was the Jumbo Shrimp Cocktail. Fourth was the Mongolian Beef Flat Bread. Anyway, everyone had the opportunity to taste everything. A few prejudiced, I-like-my-food-cooked people skipped the Ahi Tuna Poke. All in all, we had a delish dinner and drinks for under $20 a person. In La Jolla. Here's the shrimp cocktail. You can't tell from the picture, but the bowl of sauce is sitting on a lemon slice. Very cute presentation. That, my dear bloggy friends, concludes this week's My Town Monday post. And now I am hungry. Are you sitting down? Nice and comfortable? A coffee and a cookie nearby? Ready to delve into some great book reviews as we head into the fall? Good. You're in the right place. Welcome to the EIGHTH (I know, it's incredible!) meeting of The Book Review Club. And we're just in time for September 6 which is Read a Book Day and for Banned Books Week (September 26-Oct 3)! I'm going to hop right into my review because there are links to terrific reviews below, and I want leave you time to check them out. So....you know how sometimes you're craving a piece of chocolate? And the more you try not to think of it, the more it's on your mind. And, eventually, you just give in, find the treat and enjoy. In book terms, a Perry Mason mystery is that chocolate treat for me. Luckily, last month I picked up a copy of the 1969, 12th printing (it was first pubbed in 1943), 75-cent, paperback edition of Perry Mason Solves the Case of the Buried Clock and stuck in on my bookshelf. So, when the craving hit, I was prepared. Here's the CBS logline from the just-under-an-hour episode based on this book. It aired Nov. 11, 1958. What do I love about Erle Stanley Gardner's Perry Mason books? -I love reading the Cast of Characters. For example, the Buried Clock has Adele Blane, "who always looked five years younger or twenty years older" and Vincent P. Blain, who is "Father of Adele and Milicent, rich, charming, dignified, worried." -I love the dated language. Like: "I sure led with my chin on that one." Like: "That's the kind of cur he is." -I love knowing little details about Perry Mason, such as his love of a good steak, how he keeps his cigarettes in a humidor, how he walks with a long-legged gait. And don't even get me started on his ever-cool secretary, Della Street. -And I adore the wrap-up courtroom scene where the brilliant Mr. Mason unveils the murderer and ties up all the loose ends. To finish off, here are a few interesting facts about the author, Erle Stanley Gardner (1889-1970): He got kicked out of law school after about a month for fighting. He worked as a typist in a law office, studied law BY HIMSELF, then took the bar and PASSED. He hung out a shingle at THE AGE OF 21 YEARS in Merced, CA. He practiced law until 1933 when The Case of the Velvet Claws was published. He wrote under his own name and SEVEN pseudonyms. He loved the courtroom and steak. He married his longtime secretary (as in, she worked for him for over THIRTY years) when he was SEVENTY-NINE and she was SIXTY-SIX. I think they were waiting for his first wife to die. (I pulled these author facts from a previous post on this blog. So, if they sound familiar, no, you're not going crazy. Below are links to a bunch of wonderful reviews. Please, please, please hop around and visit. 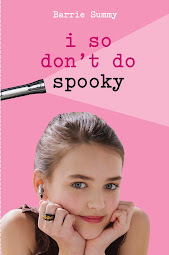 Oh, and HUGE CONGRATULATIONS to Reviewer Keri Mikulski who just landed a FOUR book deal with Razorbill/Penguin. 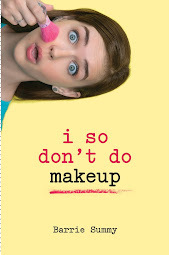 I'm sure one of us will be reviewing her first book in spring 2011! And that, folks, sums it up for September's meeting! Reviewers--if I didn't link to you, please leave me a comment and I'll fix the error right away. My kids are still home for the summer and I'm a bit frazzled.